As January comes to a close, we've got sweet sentiments, candy and of course L-O-V-E on our minds at Plaid! Our designers have imagined up four fun ideas to make your little one's desk the coolest one around. Put a hold on the recycling bin, and save a cereal box, oatmeal container or paper plate to inexpensively craft these ideas. Check out our four fun ideas with complete tutorials to make Valentine's Day Card Boxes this weekend! Want more sweet Valentine's Day ideas? 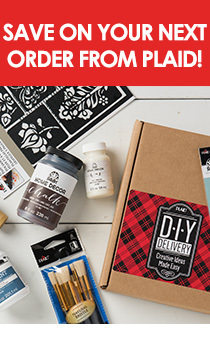 Check out Plaid Online for more ideas, and shop the Plaid Store for all your crafty needs.